If the Internet was a high school, social media would be where all the cool kids hang out. Twitter and Facebook are like the bleachers or that spot under the stairwell – the place every company wants to be. But like chest-high corduroy trousers, social media mistakes can put a company in a situation where all the cool kids are pointing and laughing. In these three examples of corporate social media blunders, popularity (or even acceptance) ends up even farther off. All too often, organizations jump into social media simply because everyone else is doing it—they rush in without direction, knowledge of their key audiences or understanding of the platform’s reach. During the unprecedented growth of Facebook in 2007, organizations saturated the social network with promotional contests to increase followers and funnel traffic to their websites. Caught up in this hysteria, Molson Canadian ran a contest to find the best party school in Canada: university students were encouraged to upload outlandish drinking and partying pictures for a chance to win a trip to Cancun, Mexico. Without a concrete understanding of key Facebook audiences, Molson failed to take into consideration first- and second-year university students who were under the legal drinking age. Criticism erupted as Molson was accused of promoting underage binge drinking and obscene behaviour. Universities also attacked Molson for portraying them as places to drink and party. The campaign was quickly pulled and the brand suffered an embarrassing blowback. In trying to be “cool” and fit in, Molson made a critical mistake that swiftly got it kicked out of the social media circle that year. In order to stay in the good books of groups on the periphery of social media, organizations have to remember that their social media efforts will ripple outside the the groups they target. And they should refrain from political taboos that can offend and ignite controversy. Last February, Egypt became the centre of the world as masses demonstrated and rioted for regime change. 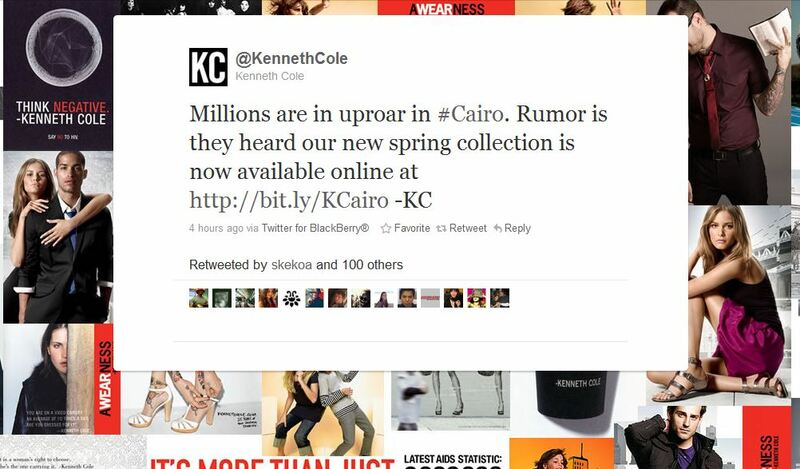 In an attempt to capitalize on this political spotlight, Kenneth Cole tweeted, “millions are in uproar in #Cairo. Rumor is they heard our new spring collection is now available online at http://bit.ly/KCairo -KC.” The fashion retailer was immediately bombarded with criticism for making light of a very serious situation and for using the “#Egypt” hashtag to siphon Internet traffic. Many even called for the boycott of the company and its products. While it makes sense to capitalize on the popularity of trending topics and world events, it’s incredibly important to think carefully about what and when to share. Unfortunately for the exec, a FedEx employee read this tweet and word spread that the person who supposedly represented FedEx was attacking a major identity of the company. Though the executive tweeted from his personal Twitter account, his name still represented Ketchum, and the relationship between the agency and its multi-million dollar FedEx account was strained (to say the least!). As the popularity of social media grows, companies and organizations need to remember that their employees are likely Tweeting and Facebooking away—and that it’s very easy to connect the online dots between an individual and an organization. Staff should be reminded that they’re representatives of a company, even on their private social media accounts. Social media networks are complex, with official and unofficial rules of conduct and best practices. Many organizations have adapted well to the new online world, devising innovative strategies to engage social media users and provide interactive experiences. On the other hand, many organizations fail to use social media effectively, rendering their Twitter, Facebook and other accounts a waste of bandwidth. I can’t help but be reminded of high school, divided into the cool kids who understood popular culture and the socially awkward kids who didn’t (and so retreated into the corners of the building). If your business is contemplating enrolling in the online high school of social media, remember to take it seriously, have direction and train your employees appropriately. After all, these might just be the best years of your life.